From Ackermann’s Repository, October 1st, 1816, Volume II, the Tattler shares correspondence from a reader who is married to a Temple Bar shopkeeper. The matron relates that business was profitable and in such a climate of prosperity her husband began to notice the fashion among other shopkeepers for keeping a second house in the country–a place away from the bustle and grime of London, for relaxation and recharging. In spite of her arguments, the spirit of rivalry remained strong in the tradesman. He went so far as to hold up the example of Spangle, the laceman, who took a lease on a marvelous country home in Edmonton. Moreover, her husband had the effrontery to rely on the well-known principle that to appear to have a fortune is an easy means by which to acquire it. A summer residence is the very thing, he exclaimed, and did I not buy that handsome winter pelisse for you when you told me that keeping up appearances was critical to the status of a shopkeeper’s wife? The result: they took out a lease on a very genteel home along a major coaching road from London, and not above four miles from the Exchange. It was not long before the novelty of the summer house began to wear thin. The nearby turnpike rendered the environs dusty, so that the windows must be kept shut even in summer. The garden at the back, beautifully arranged with twining honeysuckles and jessamine, was nevertheless made unpleasant by the sounds and smells of the neighbor’s hog farm situated at the back of it. The worst, however, was the continual plague of acquaintances from town. Full of excitement over the new acquisition of the “villa,” and with the easy manners of familiarity, these so-called friends of the tradesman began to make it their custom to ride out into the country for a visit, and of course, ask his long-suffering wife if they could take their Sunday’s “mutton” while there. “We have three children and this confounded country house,” the correspondent concludes, railing that the latter was far more expensive than maintaining and educating a dozen of the former! This entry was posted in Regency, Uncategorized and tagged Ackerman's, Ackermann's r, Ackermann's Repository, Regency shopkeeper, vicarage house by Angelyn. Bookmark the permalink. This little tale puts me in mind of the wise saying by one of ‘Conversation Sharp’s’ friends – it may have been Sidney Smith – that “a man with many houses has no home”. Sidney Smith and “Conversation” Sharp have both been featured in this blog for precisely giving us such wise sayings! Thank you for stopping by, David. Great post, Angelyn 🙂 I love that the laceman’s name was “Spangle.” Also, the shopkeeper’s philosophy reminded me of the pretentious, social climbing lead character in that old show Keeping Up Appearances. I believe she once forced her husband to purchase a country home, too. Oh–that show was positively a master study of characterization. Of that housewife, Hyacinth Bucket, who insisted her last name be pronounced bouquet — “it was always pronounced Bucket until I met you!” her husband would retort. Thanks for your comment, Mimi! I love this! Great information, Angelyn. Thank you, Cheryl–I’m so glad you enjoyed the post! I think I can relate to this experience! I’m sure you can–dear me, such a tangle of commitment! 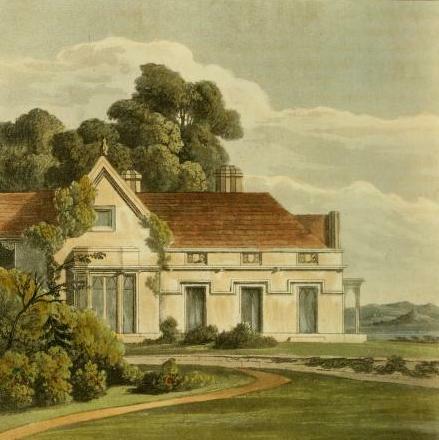 The Regency country house. Thank you, Angelyn!